A new, subscription-based digital learning solution from HMH and BenchPrep provides interactive instruction, customized curriculum and progress management tools for select subjects. Houghton Mifflin Harcourt (HMH) is out with a set of interactive test preparation and subject review guides that leverage content from CliffsNotes, a popular study guide series acquired by HMH in 2012. With logistical support from digital learning platform BenchPrep, the guides offer interactive, customized curriculum and progress management tools to help students manage their student performance. CliffsNotes Test Prep is designed to “help students identify strengths and weaknesses, stay organized with a personalized study plan and simulate the test-taking experience with interactive practice exams followed by actionable score reports,” according to HMH. CliffsNotes TestPrep utilizes BenchPrep’s instructional design principles and learning techniques “to improve engagement and learning outcomes,” according to the news release. It incorporates game mechanics, micro-learning modules and user interaction elements from BenchPrep to “deliver an engaging learning experience.” The digital solution will be offered on the CliffsNotes site, which averages 4.5 million unique visitors per month. “BenchPrep shares HMH's commitment to improving learning outcomes and its outstanding technology has allowed us to reach this new milestone for CliffsNotes, as we increase digital capability and enhance personalization," said Bruce Nichols, senior vice president and publisher at HMH Trade Publishing, in a statement. 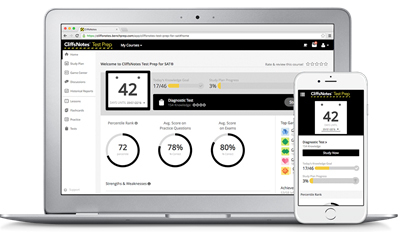 “The CliffsNotes digital learning solution will enable student success by delivering a compelling, personalized learning experience wrapped around best-in-class content," said Ashish Rangnekar, BenchPrep CEO and co-founder, in a prepared statement. "With this partnership, we will redefine how millions of students engage with their favorite content." HMH plans to release additional subjects in 2017. Further information, such as prices and current special offers, can be found on the CliffsNotes Test Prep site.